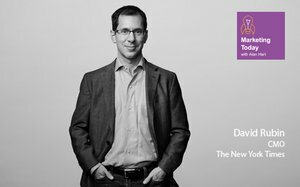 This week on “Marketing Today,” I speak with David Rubin, CMO of The New York Times. Rubin had a somewhat unexpected career beginning for a marketer. Right after college, he spent two years working on Capitol Hill for a Milwaukee congressman and two years in the Treasury Department during the Clinton administration. Then he received an MBA from the Wharton School before joining Unilever. During his 13 years at Unilever, Rubin worked in brand building, helping launch Axe body spray and leading the turnaround of its U.S. Hair division. After that, he spent two years at Pinterest as head of global brand before joining the Times. During the podcast, Rubin discusses how being a product of the Baltimore public school system shaped the way he builds teams, the fake news phenomenon, the recent TV-focused work he’s overseen in marketing the Times, and the paper’s shift from an advertising-based business model to one that is subscription-first. “What we find is that the more we grow our consumer base and connection with the end user, the better our ad business gets," Rubin says. "And that may be counterintuitive, but they come together.